Home » Hormones » How Do You Know If Your Estrogen Is Too High? Estrogen plays an important role through the course of our reproductive lives and beyond. It regulates our menstrual cycle, strengthens our bones, controls our cholesterol, and much more. Menopause is the time in life, usually around 52 year olds, when our estrogens naturally drop, and we stop having periods. Before menopause, varying levels of this vital hormone can wreak havoc. That’s because estrogen requires a delicate balance with other hormones, particularly progesterone. When that balance is disturbed, we can experience a wide range of frustrating symptoms. This hormonal imbalance can occur from the moment we start our periods, called menarche, all the way through our menstrual years. As a result, our practice sees many women who are dealing with unexplained weight gain, mood swings, menstrual problems, and low libido. Help is available! A few simple steps can help you restore balanced estrogen levels and feel like yourself again. Estrogen dominance can impact many areas of our lives, with symptoms that range from subtle shifts to major disruptions in wellbeing. Many women in this age group assume these issues are a normal part of aging or a consequence of their busy schedules. But even a slight imbalance in hormone levels can lead to a number of problems. Does that list look familiar? We see many women every month with complaints like these. We understand how frustrating they can be, especially when you’re unable to find effective treatment. And, of course, the complex relationship between estrogen and our emotions can only magnify the frustration. Who wants to feel irritated about feeling irritable? To understand estrogen dominance, we have to consider the role of another important hormone, progesterone. Progesterone and estrogen maintain an often tricky seesaw in our bodies. Estrogen dominance isn’t necessarily a surge of estrogen, but an imbalance in that seesaw. 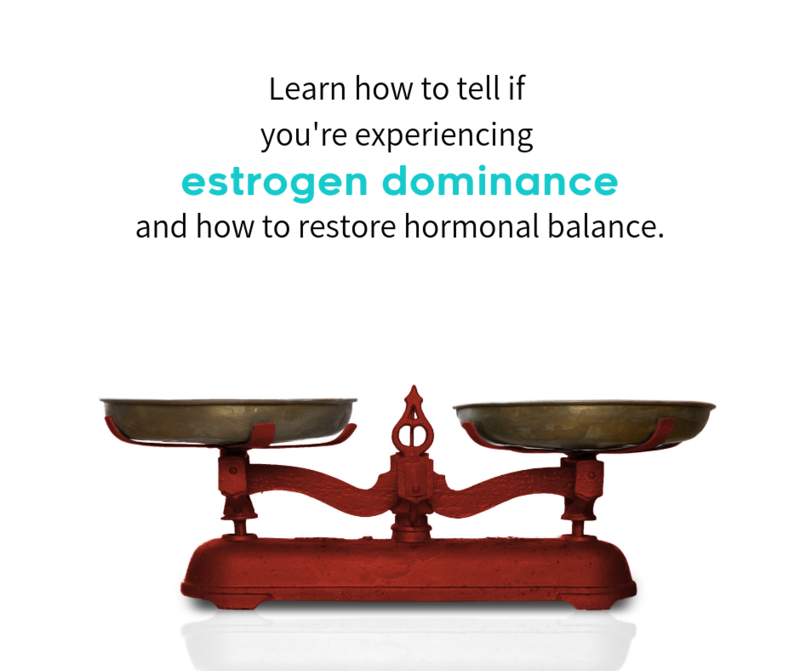 Simply put, estrogen dominance happens when either there is normal estrogen and low progesterone or elevated estrogen with normal or low progesterone. Excess body fat can increase estrogen levels, since fat cells produce estrogen. Of course, this creates a frustrating cycle for some women, as the fatigue associated with estrogen dominance makes it difficult to lose weight. Typical agri-industry meat and poultry products contain hormones they feed to those animals in feedlots. Chronic stress will throw off your hormonal balance, often resulting in excess estrogen. In times of stress, your body produces too much cortisol. Cortisol negatively affects progesterone production, so the result is a shortage of progesterone to balance the body’s estrogen. Hormone replacement therapy that doesn’t take all hormones into account and doesn’t treat with customized dosing, can inadvertently create estrogen dominance. Low fiber diet: fiber in the intestinal tract binds to estrogens detoxed from the liver; if there is not a lot of fiber in the gut the estrogens can be reabsorbed. Weak liver: The ovaries produce estrogen, but then the liver metabolizes the hormone and excretes it through the bile. If the liver is weak or burdened with other toxins he has to cleanse from the body, it may not excrete estrogens levels promptly. Poor diet: High sugar, low essential fatty acids, low B vitamins, low magnesium, (etc); there are many nutritional imbalances that can help through the reproductive hormonal system out of whack. Increase your intake of fiber. Insoluble fiber can bind with estrogen in our digestive tract. As a result, excess estrogen is eliminated with a high-fiber diet. Eat healthier and go organic. Many pesticides have been identified as estrogen disruptors. That means they disturb the natural balance of estrogen. Research is still being done in this area, but the connection is becoming clear. Plus, organic food is delicious! Avoid environmental toxins such as exterminators, especially in your home! Decrease stress. Again, we realize this is easier said than done! But an estrogen-dominant diagnosis might be the wake-up call you need to take a step back and assess your stress levels. Are you doing too much? Do you think you might have a hormonal imbalance? Do the estrogen dominance symptoms sound a bit too familiar? Please contact us and we’ll get to the bottom of what’s going on and create a plan of action to bring your body back to good health. Call us at 480-284-8155 or email at goodhealth@azimsolutions.com.